Chris Petersen of Washington and Mike Leach of Washington State appear to have signed top recruiting classes, among the Pac-12’s best. University of Washington football coach Chris Petersen put the finishing touches on his 2018 recruiting class Tuesday, one day after Jacob Eason, a former five-star quarterback out of Lake Stevens High, officially transferred to Montlake from the University of Georgia. 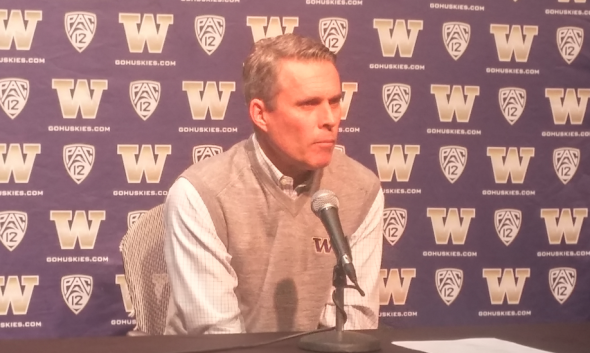 Petersen has not only signed perhaps the Pac-12’s best class, but obtained in Eason the overwhelming favorite to succeed Jake Browning. In addition to welcoming Eason, Petersen Wednesday added two high school seniors, DB Julius Irvin of Anaheim and DL Tuli Letuligasenoa of Concord, CA. Their signings, along with the 19 Petersen inked to national letters of intent during a new, early signing period in December, brings to 22 the number of 2018 commits to UW. 247 Sports ranked UW’s recruiting class No. 2 in the conference behind USC, which signed four five-star recruits to Washington’s two. Oregon, UCLA and Utah trailed the Trojans and Huskies. Of Washington’s recruits, 12 garnered four stars from various rating agencies while one, LB Ale Kaho of Reno, drew five stars (see Washington recruits from the early signing period). In Pullman, coach Mike Leach ended the first day of the traditional signing period with a total of 24 recruits, including two with four stars and a dozen more with three. Among the Wednesday signees: DL Misiona Aiolupotea-Pei of Gold Coast, Australia; OL Blake McDonald, a 6-5, 315-pound offensive lineman from Danville, CA., and Tyrese Ross, a defensive back from Jacksonville, FL. “I think this is one of our best classes,” Leach said. The star, so far, is four-star quarterback Cammon Cooper, a lefty who broke nearly all of Utah’s prep records last season at Lehi High School (near Provo). Cooper has been compared favorably to Drew Bledsoe. The Cougars also have four-star recruit Rodrick Fisher, a wide receiver from Spokane. “I think he was the best (quarterback) in the country this year,” Leach said of Cooper. The 6-foot-5 Eason, the 2015 Gatorade national high school player of the year, considered Washington before selecting Georgia. He became the Bulldogs’ starter in 2016 as a freshman and threw for 2,340 yards with 16 TDs and eight interceptions. He won the job last fall, but a knee injury in the season opener allowed freshman Jake Fromm to step in and lead Georgia to the SEC title and a berth in the national championship game. Eason will sit out the 2018 season under NCAA transfer rules and will have two years of eligibility at UW. Irvin played defensive back and wide receiver last season and was ESPN’s No. 30 cornerback recruit in the country. His father, LeRoy Irvin, played corner for 11 seasons in the NFL and was a four-time All-Pro (1981, 1982, 1985 and 1986) for the Los Angeles Rams. As a senior in 2017, Letuligasenoa helped lead De La Salle to an 11-2 record, the CIF North Coast Section championship and a berth in the state open division championship game. He made several all-state and all-metro teams and was a last-minute flip from USC. Interesting that in a highly touted class of 20 or so, roughly half will end up staying and playing. The other half will be a combination of academically ineligible, giving up on football, transferring, injured or dismissed.